Annual Women in Technology event promotes limitless career possibilities. 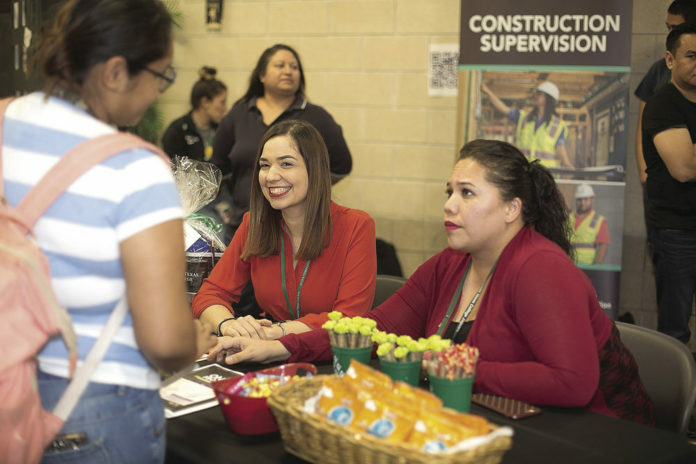 McALLEN — South Texas College hosted the 9th annual Women in Technology expo last week with the goal of exposing women of all ages to careers they might not always think are for them. STC’s Business, Technology and Public Safety departments came together last week to highlight fields in need of female representation. From automotive technology, to culinary arts and engineering, attendees had a wide array of booths with information about areas in demand in the region where they could make an impact. This year was also the first in which the college hosts a day specifically targeted for high school students. As Adame said, they saw the need to start spreading the message to school-age females that may be choosing careers at an earlier age. In automotive technology, for example, there tends to be an average of three to five female students per year for the certificate program out of a cohort of 150 students, said Richard Wade, assistant program chair. The same happens in Advanced Manufacturing Technology where females tend to be a minority both in the classroom and in the fields. Erika Guerra, a fulltime faculty member in advanced manufacturing at South Texas College, said this semester for example she only has three female students in her class of 50 students. Many females, Guerra said, have the misconception that manufacturing involves being in front of a machine all day, but don’t realize that the industry has many positions and new technology in which they can specialize. There are also specific grants and scholarships to help fund the specific needs that some females might face if they wish to go back to school or enter a male-dominated career, including childcare within the college and transportation. Wade said that in his field, there are grants to help them buy tools and pay tuition if they go into this field.